A gift from Wex board chairman Michael Dubyak is intended to launch a state-of-the-art tech complex for students that will also be open to K-12 programs and midcareer professionals. Jeremy Qualls, dean of the College of Science, Technology and Health at USM, can look forward to high-end equipment for a growing number of tech-focused degrees. A $1 million private donation is expected to jump-start a digital innovation center at the University of Southern Maine. “We have to have strong higher education programs,” says million-dollar donor Michael Dubyak. 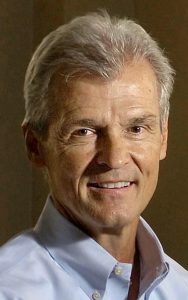 With his donation, Michael Dubyak, chairman of the board of directors at Wex, intends to speed up financing for modern classroom and laboratory space in the university’s science building – a key component of educating graduates for a digital economy. The university plans to update existing space on its Portland campus to emphasize computer science, digital learning and collaboration with local businesses. “My money alone won’t fund everything, but it will be a big start for them to kick off the programs” and put the infrastructure changes in place, Dubyak said in an interview. Dubyak, the former president and CEO of Wex, a South Portland payment processing firm, is also co-chairman of Focus Maine, an initiative to create jobs in Maine’s growing industries, and a board member for Educate Maine, a group pushing to match education with workforce needs. “If we are going to be a successful state, we have to have strong higher education programs,” Dubyak said. The vision for the new space is 9,000 square feet of computer labs, offices and collaborative workspace laid out more like the offices of a Silicon Valley tech firm than a traditional classroom. For Jeremy Qualls, dean of the College of Science, Technology and Health, that means lots of glass walls, natural light and high-end equipment for a growing number of tech-focused degrees at USM such as computer science, cybersecurity, programming and mathematics. The Michael E. Dubyak Center for Digital Science and Innovation won’t be limited to students in his college, Qualls said. Students with different majors will be able to integrate digital learning into their course work and it will be open to K-12 programs. Midcareer professionals will be able to take classes and brush up on their technical skills at the center, too. “We are working with this space to meet the demands of our community,” Qualls said. 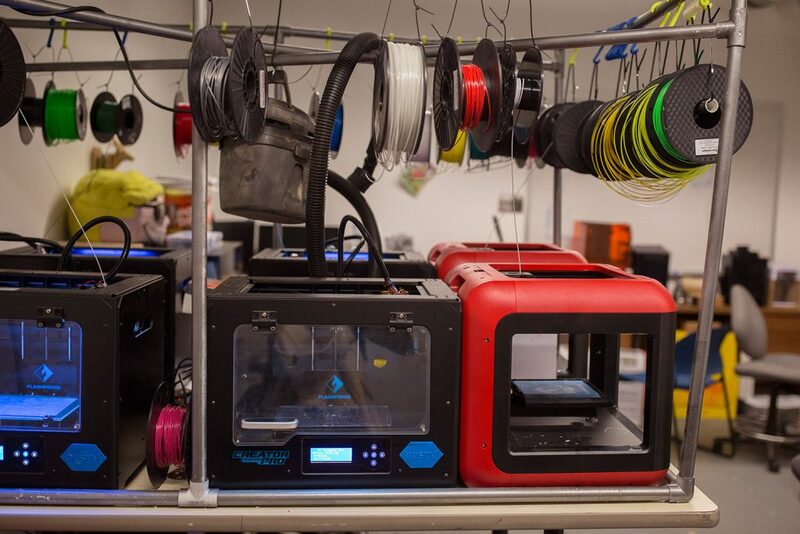 The “maker space” with 3-D printers at the University of Southern Maine, seen Tuesday, will be moved into a larger space. The proposal includes a 2,000-square-foot fifth floor “maker space,” including digital design and a 3-D printing lab. The 7,000-square-foot second floor would be transformed into the envisioned learning hub. About 550 students majoring in computer science and cybersecurity, mechanical and electrical engineering, technology management and information technology and physics will directly use the space. Central to the plan is coordination with local industry, Qualls said. 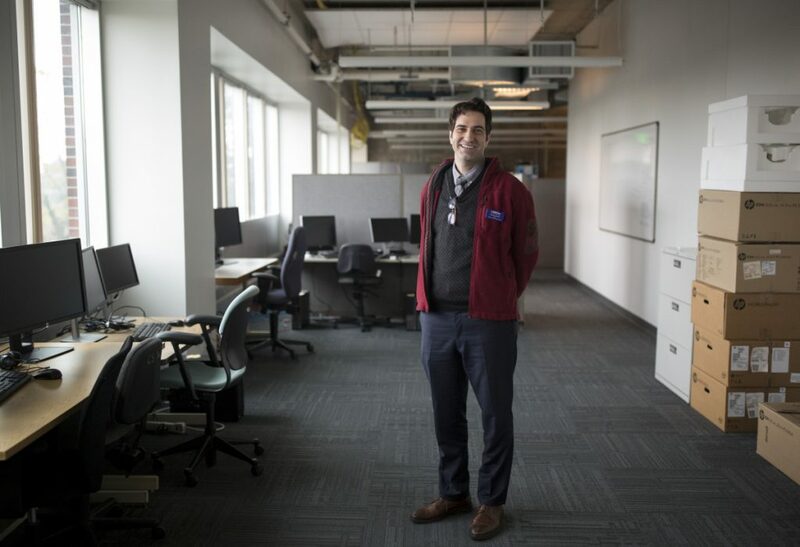 Maine companies clamoring for highly skilled tech workers will be invited to work alongside students inside the new center through internships and a possible “executives in residence” program. The goal is to prepare students for the workforce, Qualls said. “I think it is a disservice to students not to give them real-world experience,” he said. About half of Dubyak’s gift will help start a new “Step-up to STEM” monthlong program for incoming USM students planning to major in science, technology, engineering and mathematics. The remainder will be used to help pay for the new center, expected to cost $2 million to $3 million. Officials plan to use federal funds, private donations and, if approved, some of a $49 million higher education bond on the November ballot to update the space. The university would like to have the center ready for the 2019 fall semester, when it launches the Step-up to STEM program and a cybersecurity master’s degree.